A few months ago, a friend of mine bought a BMW X4. He reckons he is just about at home now with how to use the impressive communications technology available. He reckons the phone system is particularly good. In our test BMW X4 (BMW calls it a Sports Activity Coupe), I admit to not trying this out because I simply don’t like talking on a phone when I am driving. That said, I do think that voice command is an important feature that allows you to keep your eyes on the road; the BMW’s takes some getting used to, it being necessary to make several selections to get where you want to be, but, in general, the car was user-friendly in respect of its driver-assistance features. It could be said that the BMW X4 is a capable office on wheels. It was fun, too, to try out the gesture control, whereby you don’t actually have to touch anything. Again, a sensible idea for safety, that an owner will get to learn…of course, you do have to take a hand off the steering wheel. BUT: there was one strange omission – my home address was not to be found in the satnav. Neither the street nor the post-code; and we have been here for twenty-five years. Is it me, or do others also find the shape of these cars (and similar from Mercedes-Benz), being tall-coupe in style, a bit gawky? Whatever, the drag-coefficient is an impressively-low 0.30. The shape, therefore, contributes to the car’s economy, as does, for example, the fact that the engine is hardly more than idling at 70 mph on the motorway; well, perhaps a bit more, at 1700 rpm. So the X4, the 2-litre diesel, in this case, is an excellent cruiser. Overtaking can be safely brisk from the 190bhp engine, while general pottering about is done in a smooth and quiet way. Three driving modes are available, Sport, Comfort and EcoPro, this last turning the instruments into a blue colour. The Adaptive Suspension was a little on the firm side even when in Comfort, but the car nonetheless provides a very comfortable ride, with the test car having ‘Sports’ seats in the front that were fitted with lumbar control. Getting into and out of the car is easy, although there was no grab-handle, and, once aboard, the driver gets hold of what is quite a fat steering wheel. The steering itself is speed-sensitive and great for parking. By the way, manoeuvres in tight spaces are made a lot easier if the optional £500 all-round-and-above camera system is fitted. Out on the road, the handling is excellent, as you would expect from this BMW, which has 50/50 weight distribution. High-speed cornering is, within the laws of physics, kept safe by automatic Cornering Brake Control. The automatic gearbox has eight speeds, but you would be hard-pressed either to know which gear you are in or when changes are made, highly impressive. Of course, manual paddle operation is available. There are nice touches to be discovered, such as the ambient lighting in the footwells, gently-lit door panels and, if it’s night-time, an open door throws a striped light pattern onto the ground. Thanks are due to the designers who have not over-endowed the car with warning bells and buzzers and allowed the gearbox to stay in ‘D’ and not have to be released by pressing the brake after having come to a stand-still. We all know the amazing array of features that can now be had with this class of car. The BMW is of course as competitive as any in this regard, in the realm of comfort, convenience and safety. It also scores well as a car that not just the driver, but passengers, too, would enjoy travelling in. Just one example is that passengers in the rear (the X4 can comfortably take two at the back, three at a push) get their own heating controls. As to luggage space, the boot is a good size and has a useful below-floor compartment. There is no spare wheel because the car is on run-flat tyres. Of the extra-cost options fitted, the Technology package, at £1690, include a Display Key; this is a smart ignition key that includes a little monitor that allows you to see, for example, and amongst other things, if you have locked the car. As to a couple of basic stats, this X4 emits 146 g/km and the trip computer told me that, in more than three hundred miles of varied driving conditions, the fuel consumption stood at 40.7 mpg. The cost of a basic car, if there is such a thing, is £47,000. Add in Sophisto Grey Xirallic paint, Fiona Red/Black Merino extended leather seats and the price goes up. 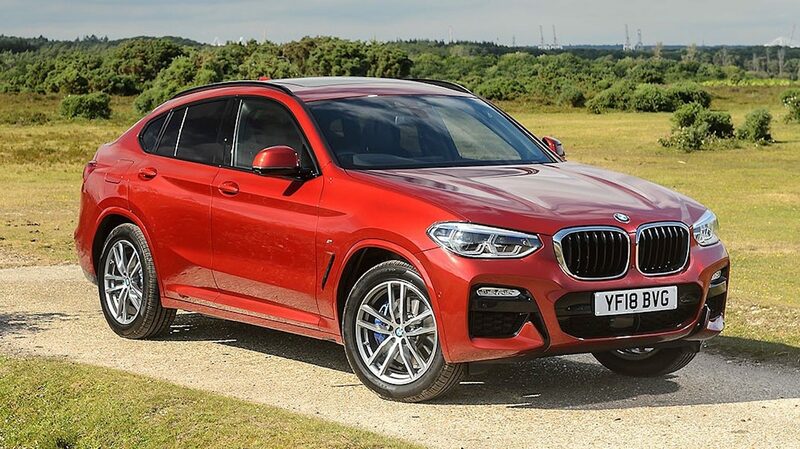 The packages and other desirable features brought the test car — full nomenclature BMW X4 xDrive20d M Sport B47 2.0d — to £56,775. Ouch, but a very nice car, and, to be fair, with only a couple of flaws that would be easy to remedy.